Remarkable Marketable Me: Habitat for Humanity Restore ~ Question ~ "Can implementing the three R's - reduce, recycle, reuse, save you money? 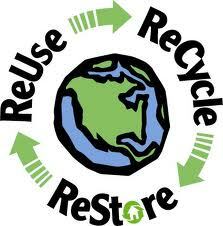 Habitat for Humanity Restore ~ Question ~ "Can implementing the three R's - reduce, recycle, reuse, save you money? Click on the link above to see the Habitat for Humanity main page! Hi Jean Robb, here. I think we all know what a big fan I am of Habitat for Humanity. Did you know you could shop at a Habitat Restore and help build a home for a family in need? Lots of people want to volunteer for Habitat but don't want to be out in the elements. Here's a way to help and be indoors! While every ReStore outlet is a little different, most focus on home improvement goods like furniture, home accessories, building materials and appliances. ReStore resale outlets accept donated goods which are sold to the general public at a fraction of the retail price. The proceeds help local Habitat affiliates fund the construction of Habitat homes within their communities. If your company would like to donate a large quantity of building materials, furniture, and/or appliances to Habitat for Humanity, please e-mail our Gifts in Kind department at giftsinkind@habitat.org. Your local Habitat for Humanity may be able to help. Search for the local Habitat in your community. Did you know that your gift does much more than help families escape from unsafe, unhealthy living conditions? You’re helping families to break the cycle of poverty and build long-term financial security. Habitat’s affordable, no-profit house payments free up money for food, child care, medicine and other necessities. And research has shown that decent housing improves health, increases children’s educational achievement and strengthens community ties. Thanks to your support, Habitat is transforming the lives of more than 2 million people around the world! Dallas Area Habitat needs help in our ReStores--both group and individual opportunities available! The ReStores are a great venue for volunteering because you can be moving around but not out in the elements. · Monday - Saturday from 12 to 4 p.m.
· Monday - Saturday from 4 to 7 p.m.
· Sundays from 10 a.m. to 2 p.m.
· Sundays from 2 to 6 p.m.
We ask volunteers not to wear really short shorts or shirts with offensive graphics/language, and we do recommend sturdy shoes. The minimum age is 16, with parents/other adults volunteering the first time with anyone under 18. We also are recruiting groups of 10 to 20 every single Saturday in our ReStore warehouse in west Dallas for a 4-5 hour shift to help us inventory and sort donations coming into our warehouse space. To volunteer, reply to this e-mail with the date(s), ReStore location, and shift time(s) you are available to volunteer. Please forward to others who might be interested and able to help as well.